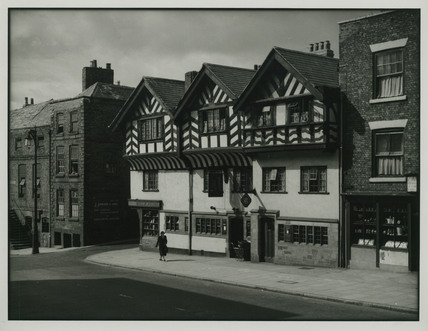 Photograph of the Kingshead Inn, Chester on Lower Bridge Street. The inn was built in 1622, one of the oldest hotels in Chester, and is a grade one listed building. In this picture a woman is walking along the pavement outside the inn, and a pram is parked outside the inn door. Just beside the inn a sign for J. Johnson & Sons, Baby Carriage Manufacturers can be seen.